BubbleWrap is a new textile-based tactile display that provides active feedback through vibration, but also controls passive properties of a surface, such as shape and firmness, dynamically. BubbleWrap can be wrapped around a wide range of surfaces and objects. It consists of a matrix of custom-made electromagnetic actuators enclosed in stretchable fabric, with individually controllable cells that expand and contract. A BubbleWrap actuator consists of a coil sewn on a stretchable textile and a permanent neodymium magnet, glued on a second piece of textile. The two pieces of textile are then sewn together, opposing the magnetic poles of the coil and magnet. When current is injected in the coil, the coil repels the magnet. The intensity of the current flowing through the coil sets the thickness of the BubbleWrap unit. 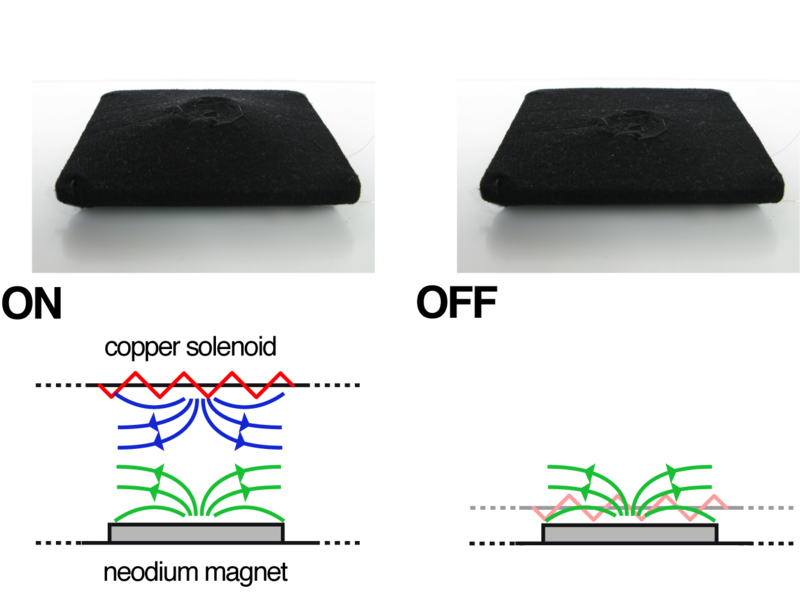 Once the stretchable textile reaches its maximum tension, the current then sets the firmness of the unit. Finally, modulating the current flowing through the coil over time generates vibrations of given modulation frequency. As a result, one actuator can provide three types of feedback: vibration, shape and firmness change. BubbleWrap can be easily wrapped around objects and devices, or laid onto a wide range of surfaces. 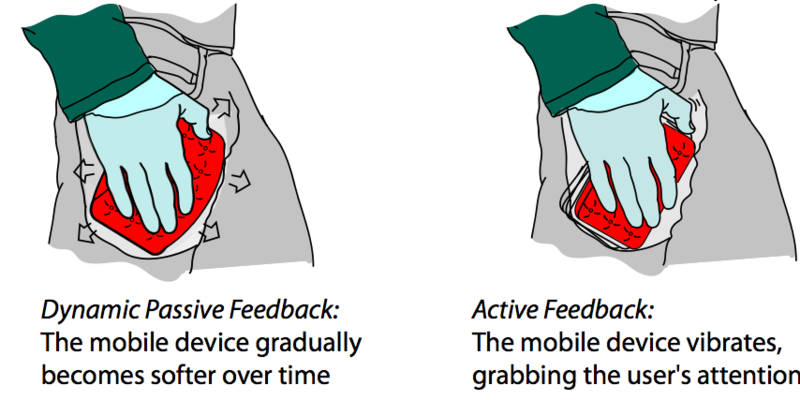 It can provide active feedback, grabbing the user's attention. For example, interfaced with a mobile phone, it could create different vibration patterns to notify the user of a new message received or an incoming call. BubbleWrap can also provide dynamic passive-feedback through shape and firmness changes. For example, it could notify the user of slowly changing information, such as battery level, or the download status of a file through passive properties of the display without interrupting the user. The coils could be replaced by Electro-permanent magnets to limit the electrical current consumption of a BubbleWrap actuator. These magnets require a current impulse to change polarization, instead of constant current flow. 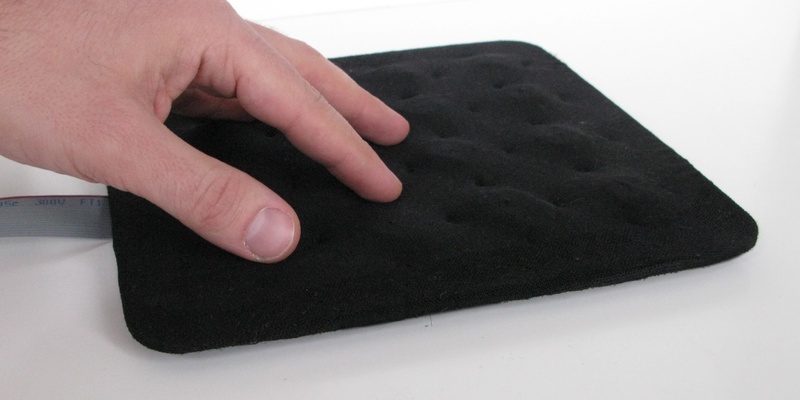 BubbleWrap: A Textile-Based Electromagnetic Haptic Display. BubbleWrap was developed in collaboration with Uros Petrevski (ENSCI and NoDesign), in 2009. Illustrations by Mathieu Peyroulet-Ghilini. Sewing supervision by Ermenegilda Bau.